What are Macules and papules? 1 What are Macules and papules? 2 What is Maculopapular Rash? 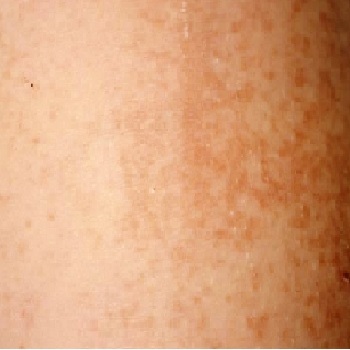 Macules are a small, flat, non-elevated and discolored area on the skin. Usually, macular rashes do not require any treatment initially, but in case it continues for more than two weeks, a doctor needs to be consulted. On the other hand, papules are small swollen bumps on the skin. Papules are also known as HIV rash. A maculopapular rash is a skin condition in the form of macules or papules or both. Termed as maculopapular with the fusion of the two words, they are tiny red spots that are found in different areas of the skin. These raised patches appear due to several medical reactions and infections like Measles, Scabies and Syphilis which normally occurs when the immune system gets weakened. The rashes often lead to the growth of tiny inflammations on the skin in the form of lumps commonly found on the hands and feet. They may be both flat and elevated lesions appearing on the skin that tends to merge. If these rashes develop larger than 1 cm in size, they are then considered as patches. But if they are merged, then it is a plaque. They are found in acute, less advanced and chronic stages. Subacute conditions may last for one to two months. Chronic cases these rashes may stay for more than eight weeks. Maculopapular rashes are common in all age groups and may develop at any part of the body, be it the trunk, face or any other area. Adults mostly suffer due to the side effects of certain drugs and allergic reactions. On the contrary, children suffering from viral infections are prone to get these rashes on their palms and soles of feet. In earlier stages, they may be red but gradually develop discoloration. Reaction to drugs: An intake of several medicines such as antibiotics, anticonvulsants, Cefobid. Cefoperazone sodium, etc. for a prolonged time may cause allergic reactions. A low fever and muscle pain may accompany these rashes but would fade away in a week or two. Epstein Barr Virus: A virus infection leading to painful eruptions on the skin along with fever is common among cancer patients mainly in China and Africa. 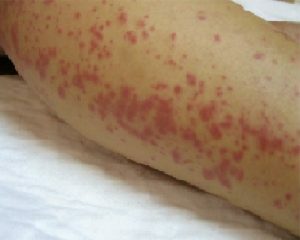 Syphilis: People infected with Syphilis which is a sexually transmitted disease may develop these rashes on their genital organs which can be quite itchy and painful. Scabies: Infections caused by itch mites is known as Scabies and may cause serious itching anywhere on the body. 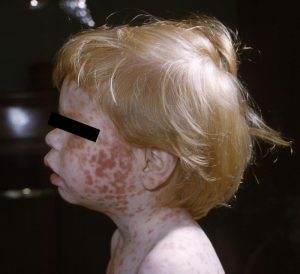 Rubella: German measles termed as Rubella may also be a reason. Chikungunya: Maculopapular rashes accompanied with high fever and joint pain can be caused due to Chikungunya. Dengue: Patients suffering from dengue due to mosquitoes can be infected by fever, rashes, joint pain and even a drop in the platelet count. HIV: AIDS primarily caused by the HIV can also contribute towards these rashes. Infections such as EBV infection, measles, scarlet fever, herpes, Ebola, hepatitis B or C, etc. One major complication linked to this is the Zika virus. It can affect the baby even if the mother has had mild symptoms of the disease. It can cause an underdeveloped head in the baby of the mother affected with the Maculopapular rash caused by Zika virus during the initial months of pregnancy. Hence, one should check up with the doctor during pregnancy to detect if she has got any exposure to the Zika virus which is a sexually transmitted disease or born by mosquitoes.